You have taken the first step and made the decision to purchase an elliptical trainer, the problem is there are so many available you are overwhelmed, and not sure which elliptical trainer is the best for you. Elliptical trainers range from compact under-desk trainers to feature-packed heavyweight trainers and cross trainers. We have compiled a comprehensive list of the top 5 best elliptical trainers to save you time and money. The InMotion elliptical trainer by the Stamina brand is one of the best under-desk ellipticals currently on the market today. This compact powerhouse is loaded with great features, much more than you would expect in an under-desk trainer. Designed for people who are to busy to get to the gym for a workout, it enables you to workout discreetly in your office, or in front of the TV, all from the comfort of your chair. The Stamina InMotion under-desk elliptical trainer can be used while sitting or standing. The versatility of this trainer sets it apart from other trainers in its class. Many under-desk trainers can only be used while sitting. It also has both forwards and back pedal motion. This makes it more effective as it targets different muscle groups when going backward than when going forwards. The adjustable tension allows you to mix up your workout by changing the resistance and the intensity levels. This offers you variety in your workout preventing you from getting bored and makes the workout more effective. The electronic monitor displays total strides, strides per minute, time exercised, calories burned and has a scan mode that scans through all the stats while you are exercising. This InMotion elliptical trainer is well designed and constructed using sturdy and durable steel. 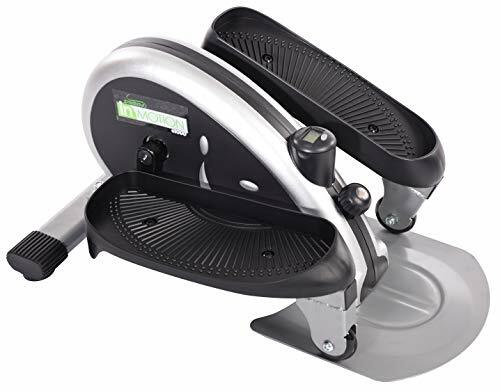 The pedals are textured for extra grip and the end caps are non-slip to prevent the unit from moving around while you are exercising. The silent operation allows you to exercise discreetly while sitting at your office desk and it is available in three color options: black, lime green, and bright orange. The only letdown on this unit is that it does not have any Bluetooth connectivity for you to connect to other devices to track your progress. MULTIPLE MOVEMENT OPTIONS: Depending on your needs and abilities, the In Motion E1000 Compact Strider can be used sitting or standing. Pedal forward or reverse to target different muscles. THREE COLOR CHOICES: Customize your exercise machine by choosing one of three vibrant color options. The In Motion E1000 Compact Strider comes in green, orange and silver. The Cubii was designed by a student busy with his first internship. The first prototype was made in a university design shop and you can see just how far it has evolved since then by looking at the current Cubii Pro model. Their mission is to incorporate exercise into your everyday life and they have succeeded. The Cubii Pro has all the features you would want and more. The best feature on the Cubii Pro is that it is Bluetooth enabled. You can easily connect it to your Fitbit or Apple Healthkit to track your progress. You are also able to connect to other apps and smart devices that are running iOS 9 or above, Android OS 4.4 and above. The Cubii Pro has been designed to be whisper quiet, so you can exercise no matter where you are without disturbing colleagues or family members. The durable and sturdy machine is made to be non-slip and built to last using better parts and materials than in previous models. The patented ergonomic angles were specially designed to give you a smooth exercise with very low impact on the joints. It is available in two colors, black or chrome, and has 8 preset programs suitable for all fitness levels. The downside of the Cubii Pro under-desk elliptical trainer is the price tag. Compared to other under-desk models, it is quite expensive. LOW IMPACT HOME WORKOUT - Designed with ultra-smooth gearing, Cubii home elliptical machines are ideal for exercising at home, or office, without stressing your joints! TRACK YOUR FITNESS GOALS - The Cubii Pro syncs steps, distance, and calories burnt with iPhone and Android cellphones, Fitbit smart bands, and Apple Health Kit, so you can set and track your goals! KEEP FIT WHILE YOU SIT - Workout while you work, rehab while you rest, this under desk elliptical can be used on the couch, at your desk, even at the dining table! 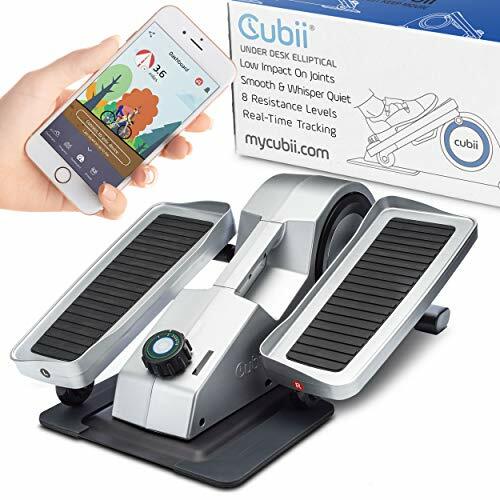 PERFECT HOME EXERCISER - Unlike sit and stand ellipticals, Cubii is optimised for seated use, the low step pattern means that it's easy to use under low desks, and the compact, space saving design, keeps your home clutter free! THE QUIETEST HOME ELLIPTICAL - Whisper quiet, the Cubii Pro seated stepper is near silent in use. It won't disturb your colleagues, or have you struggling to hear the TV! 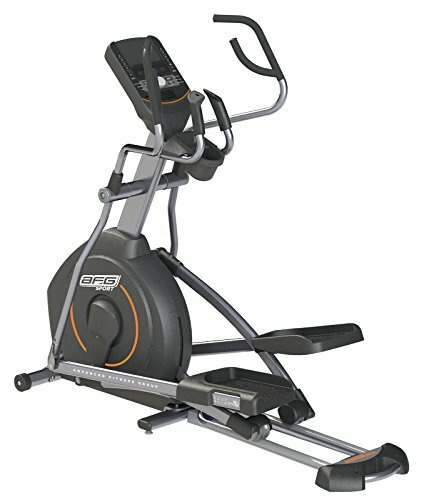 The BFX8000 elliptical cross trainer is an entry-level cross trainer from Body Power. Body Power has made a huge impact on the market in a very short time. 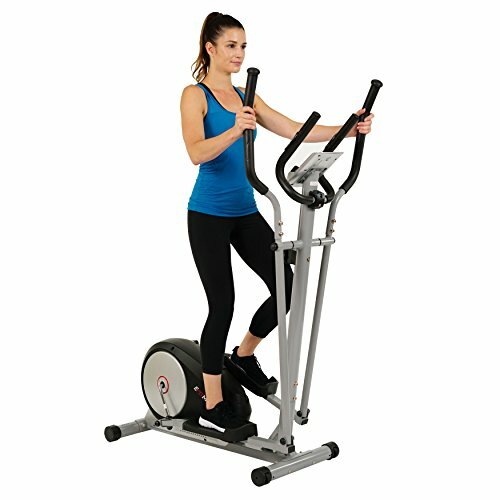 It is top of the range in its class with its unique design that reminds you more of a stationary bicycle than an elliptical trainer. It is an affordable option for an at-home elliptical trainer that will have you burning calories and toned in no time. This machine is built to last. It has an extremely strong and robust frame with an anti-corrosive finish that will keep it looking good as new. There is nothing flimsy about this elliptical trainer and even the flywheel is solid steel. The easy-to-read LCD screen displays time, speed, distance, and the number of calories burned. You also have the option of scan mode which rotates through the stats. The screen doesn’t have a backlight, so even though the digits are large, you will still have difficulty reading them in low-light areas. The solid steel flywheel and direct-drive belt system make this machine silent to operate, it is shockingly quiet for such a robust machine. When you are done you can move it around on the built-in transport wheels for easy storage. It has a weight capacity of 250lbs and a short stride distance, so it will be more suited to short people. The handlebars are 4-way adjustable ensuring your utmost comfort. The tension can be adjusted during the workout by turning a knob. The Magnetic E006 elliptical trainer from EFITMENT, is one of the best elliptical trainers in its price range. New kids on the block, EFITMENT, have taken the market by storm with their value for money, affordable trainers. Possibly one of the most compact elliptical trainers available, it is a great choice if you have limited space to exercise. The EFITMENT E006 has 8 levels of magnetic resistance. The tension is adjustable by turning a knob which is easily accessible. The flywheel is belt-driven giving you a quiet and smooth workout. The added advantage of the belt drive is there is little to no maintenance required. The compact E006 has built-in transport wheels and is very lightweight so it can easily be moved around and stored away out of sight. The stationary handlebars have built-in pulse sensors, so you can monitor and maintain a steady heart rate. The magnetic elliptical trainer is lightweight, small and compact with only a 13” stride distance, so it is not suited for taller people. MAGNETIC RESISTANCE - 8 levels of magnetic resistance within arm's reach, you can alter your workout aimed to help you meet your fitness goals, set difficulty levels and progress further. The 5.9AE elliptical is a middle-range elliptical from AFG Sport comes with a hefty price tag but is worth every cent if you can afford it. It is a home trainer with the frame of a commercial trainer. With a 325lb weight capacity, 23lb flywheel and 20” stride distance it is the biggest of the 5 elliptical trainers reviewed here. The 5.9AE elliptical trainer is the only one on our list that features a motorized resistance system. It needs to be connected to an AC outlet to operate so it isn’t portable. Weighing in at 201lbs when fully assembled you won’t want to move it around too much anyway. The frame is completely made of steel, so it is extremely sturdy, you can be sure that this machine won’t be breaking anytime soon, as it is built to last. 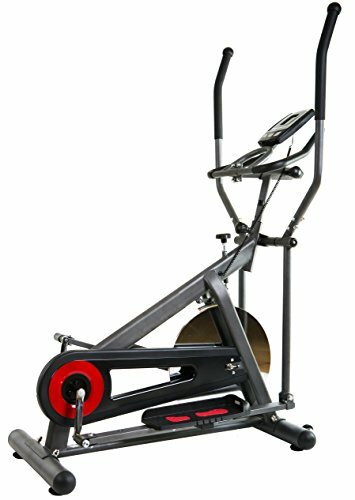 The AFG elliptical trainer is has two sets of handlebars, one moveable and one fixed. The moveable arms feature a multi-grip design, and the fixed handlebars have EGK sensors built in for pulse reading. The AFG has a large console that has an LED display; it displays speed, distance, heart rate, calories burned, and incline. The telemetric console can also read your pulse via the wireless HR chest strap transmitter that is included. The Bluetooth connectivity allows you to track and sync your progress with other devices and the free AFG app. It also features loads of small extras such as cooling fan, Bluetooth speakers, tablet holder, water bottle holder, and more. 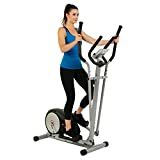 If you can afford the AFG sport 5.9AE elliptical trainer it is great value for money, it offers you everything you need in an elliptical trainer and more. However, if you have a tight budget the Body Power Elliptical Cross Trainer is a great choice; it is low maintenance, operates quietly and is not too bulky. It has all the features you need while still been compact and portable enough if you have limited exercise space. No matter what your needs one of these will be the best elliptical trainer for you.